Little-Girl-Afraid-of-a-Dog first appeared in Harper's Monthly Magazine , December, 1906, and is featured in our collections, Dog Stories and Children's Stories. “The chickens are beginning to lay again,” said Emmeline's aunt Martha, “and Emmeline can begin carrying eggs over to the poor Ticknors tomorrow.” Martha, who was quite young and pretty, cast a glance of congratulation at Emmeline, as if she were proposing a great pleasure. “Only think how nice it is going to be for those poor Ticknors, with all those children, to have half a dozen new-laid eggs every day,” said Martha, again with that congratulatory glance at her little niece, who sat beside the window, holding her best doll. “Yes'm,” said Emmeline, in a low voice. She sat full in the glow of the setting wintry sun, and her whole little blond head and delicate face were gilded by it. It was impossible for her mother and her aunt to see that she had turned very pale. She kept her face turned toward the window, too, and when she said “Yes'm” infused a hypocritical tone of joy into the word, although she was a most honest and conscientious little girl. In fact, the joy was assumed because of a Jesuit-like issue of conscience in her inner dealings with herself. The Ticknors, the poor Ticknors, with the large brood of children, lived about half a mile down the road, and Emmeline's mother and aunt esteemed it a great delight for her to carry eggs to them when eggs were plentiful. Emmeline herself never denied the delight, but God alone knew how glad she was, how wickedly (she told herself that it was wickedly) glad she was, when about Thanksgiving time, when people naturally wished to use more eggs, the chickens, after the perverse nature of their race, laid fewer eggs, and there were only enough for the family. Then Emmeline had a respite. She grew plumper, and there was more color on her little, soft, curving cheeks. “Emmeline always seems so much better this time of the year,” her mother often said; and she never dreamed why it was, although Emmeline could have told her, had it not been for her conscience, which pricked her on in spite of her pains. The Ticknors had a dog — a very small dog, it is true, but with voice enough for a whole pack — and Emmeline was in mortal terror of him. He always barked at her when she went to carry the eggs, and he always sniffed ominously around her ankles. Sometimes he made bounds of vicious yelping joy at her, almost reaching her face, although he was a little dog. Emmeline was a little girl, small for her age, which was barely ten. She was very much under the dominion, the very loving dominion, of her mother and aunt. Her father was dead. The Ameses — Emmeline's last name was Ames — lived on a small farm, and Sydney managed it. They were regarded as quite rich people in the little village where they lived, and they looked at themselves in that light. Therefore they realized a sense of duty, of pleasurable duty, toward the less fortunate people around them. At that very moment both Aunt Martha and Mrs. Ames were sewing upon garments for poor people — some strong and durable flannelette petticoats of soft pink and blue. Sometimes Emmeline herself was asked to sew a seam on these soft garments, and she always obeyed with the utmost docility, although she did not like to sew very well. She was a sober, reflective little girl, not exactly indolent, but inclined to sit quite still, while her young mind indulged in pryings into the future and conceptions of life and her own little niche in the universal scheme of things, which would have quite astounded her mother and her aunt Martha had they known of it. They saw in Emmeline only a darling, obedient, sweet little girl holding her doll baby; not as she really was — lit into flame by her own imaginings and the sun. Neither dreamed that, as she sat there and said “Yes'm” so prettily, she was shuddering in her very soul from a most exaggerated fear, stimulated by an imagination entirely beyond theirs, of the Ticknors' little dog. Soon the copper-gilt glow faded from Emmeline's head and face, and she sat, a pale little shadow in the dusk, until her mother lighted the lamp, and Annie, the maid, came in to announce supper. Emmeline had not much appetite that night, although there were her favorite fried oysters and waffles. It seemed as if the subject of the eggs and the Ticknors, which caused her to project more plainly her vision of fear concerning the little dog, could not be let alone. They had hardly seated themselves at the table before Annie spoke of the large number of eggs which had been brought in that day. Annie had been with the Ameses a long time, and was considered quite a member of the family. “I think you can carry a dozen eggs tomorrow morning, dear,” Emmeline's mother said, happily. “Only think what it will mean to those poor Ticknors,” said Aunt Martha. Emmeline looked helplessly at her plate, and said that she was not very hungry. She felt that she was wicked because she was not hungry, since she was so afraid of the Ticknors' little dog that she did not want to carry the eggs to them the next morning, when they were so poor and needed the eggs so much. Emmeline felt just then more than a physical loathing: she felt a moral loathing for anything in the shape of an egg; but she swallowed the mixture, which Annie presently brought to her, with her usual docility. Emmeline went to bed before Mr. John Adams arrived. Her mother tucked her in and kissed her, then blew out the lamp and went downstairs. Emmeline had said her prayers, introducing, mentally, a little clause with regard to the Ticknor dog. It was a piteous little child codicil to the Lord's Prayer and “Now I lay me,” which she always said. After her mother had gone downstairs Emmeline lay awake staring at the darkness. The darkness very soon seemed to flicker with wildfire; grotesque faces grinned at her from the midst of this fire, which was and was not. A terrible horror, of which the little bugbear dog was the keystone, was over her. She wanted so to call her mother, to get up and run downstairs into the lamp-lit sitting room; but she lay still, stiff and rigid. She had too much self-control for her own good, young as she was. Presently she heard the distant tinkle of the front-door bell, and heard Aunt Martha open the door and greet Mr. John Adams. Again, for a second, her own spirit of joyous prophecy was over her; but after Mr. John Adams and Aunt Martha had gone into the parlor, and she could only hear the faint hum of their voices, she returned to her former state. However, it was not very long before her attention was again diverted. Mr. John Adams had a very deep bass voice. All of a sudden this great bass was raised. Emmeline could not distinguish one word, but it sounded like a roar to her. Then, also, she heard her Aunt Martha's sweet, shrill voice, almost loud enough for the words to be audible. Then she heard doors opening, and shutting with almost a slam; then she was certain she heard a sob from the front entry. Then she heard the sitting-room door opened with a fling, then a continuous agitated hum of conversation between her mother and aunt. Emmeline wondered why Mr. John Adams had gone so soon, and why he had almost slammed the door, and what her aunt and mother were talking about so excitedly. Then, as she had not much curiosity, her mind reverted to her own affairs, and again the wildfire of the darkness flickered and the grotesque faces grinned at her, and all her pleasant gates of sleep and dreams were guarded against her by the Ticknors' little dog. Emmeline slept very little that night. When she did sleep, she had horrible dreams. Once she woke crying out, and her mother was standing over her with a lighted lamp. “What is the matter? Are you ill?” asked her mother. Her mother was much older than Aunt Martha, but she looked very pretty in her long, trailing white robe, with the lamp-light shining upon her loving, anxious face. “I had a dream,” said Emmeline, faintly. “Yes'm,” said Emmeline; and she turned obediently on her side, and her mother went out. Emmeline slept no more that night. It was about four o'clock in the morning. The Ameses had quite an early breakfast, at seven o'clock. Emmeline reflected that in three hours she should be up and dressed and at the breakfast table; that breakfast would take about half an hour; that in about three hours and a half she would be on her way to the Ticknors'. She felt almost as a condemned criminal might have felt on the morning of his execution. When she went laggingly downstairs, as Annie played a discordant chime on the string of Japanese bells, she felt weak and was very pale. Her mother and Martha, who herself looked wretched, as if she had been weeping all night, glanced at her, then again at each other. “It will do her good to get out in the fresh air,” said Martha, stifling a heavy sigh. Annie, coming in with the eggs, cast a sharp glance of mingled indignation and sympathy at Miss Martha. She knew perfectly well what the matter was. She had abnormally good ears, and had been in the dining room, the evening before, when Mr. John Adams was in the parlor with Miss Martha, and there was a door between, a badly hung door, with cracks in it, and she had heard. She had not meant to listen, although she felt that all the affairs of the Ames family were her own, and she had a perfect right to know about them. She knew that Mr. John Adams had been talking about where he and Miss Martha should live after they were married, and had insisted upon her going to live in the old Adams homestead with his mother and elder brother and two sisters, instead of living right along with Emmeline and her mother and herself (Annie). She considered that Miss Martha had done exactly right to stand out as she had done. Everybody knew what old Mrs. Adams was, and one of the sisters was called quick-tempered, and the elder brother was unmarried, and there was therefore no possible reason why Mr. John Adams should feel obliged to remain at home after his marriage. On the other side, it would obviously be very hard for Emmeline's mother to part with her sister and live alone in her big house with Emmeline and Annie. It was a very large house, and there was plenty of room; whereas the Adams house was small. There could be no question, so Annie thought, and so Emmeline's mother thought, and so Martha herself thought, but she had done right. Martha reasoned it out in her own mind that John Adams could not care so very much for her, or he would not insist upon subjecting her to such discomfort and annoyance as she would evidently experience if she were to live in the Adams house after her marriage. John had always been frank about his mother's difficult temper and his sister's, although he was a devoted son and brother. He knew, too, that Martha could not have a sitting room to herself in which to display her wedding treasures, and she could have that in the Ames house. She considered within herself that he could not possibly love her as much as she had supposed, because he had given no reason whatever for his insistence that she should comply with his wishes except that they were his wishes. Martha had a pretty spirit of her own, and she resented anything like tyranny, even in those whom she loved. So she held her head high, although her eyes were red, and said, in reply to her sister's suggestion, that she rather thought she would not. She thought she would take the ten-thirty train for Bolton and do a little shopping. She wanted to see about a spring suit, and the sooner she got the material to the dressmaker's the better. She said it exactly as if she had not planned to have that same spring suit her going-away costume when she was married. Martha had expected to be married the first of June. It was now March. When she said that about going to Bolton her sister's face brightened, and she gave her a look of pride in her spirit. “So I would,” said she. She did not notice at all how Emmeline's face fell. For a second the thought of her aunt's going with her to the Ticknors' and shooing away with her superior courage and strength that dreadful little dog had caused her heart to leap exultantly. But now that chance of respite was gone. She took a spoonful of her cereal, puckering her little mouth most pathetically after she had swallowed it. She did not care for cereal, and ate it only because her mother and aunt said that it was good for her. Emmeline had begun to wonder why so many things which she disliked, and so many things which she more than disliked, were so good for her. She acquiesced in the wisdom of her elders, but she wondered. She ate her cereal, then her soft-boiled egg on toast. She hated eggs that morning, although usually she liked them. She felt as if she was fairly eating her terror and dread of what lay before her: eggs were so intimately associated with it. It seemed to her that the fear in her heart was enough, without being obliged to have it in her stomach also. After breakfast Emmeline put on her red coat and hat (she was still wearing her winter garments), and her mother gave the basket of eggs to her and kissed her. “Don't walk too fast and get all tired out, dear,” she said. She and Martha stood at the window watching the gay little figure move slowly down the road. They need not have cautioned her against speed. She did not feel in the least inclined to hurry. “Ate it just as if she was swallowing pills,” said Annie. “Yes, she did,” Mrs. Ames agreed, anxiously. “I would,” said Mrs. Ames. It was tacitly understood between them that nothing more was to be said about Mr. John Adams, that the whole subject was to be left out of sight and hearing, and everything was to go on as before. However, as the last glimpse of red disappeared down the street, and Martha's step was heard overhead, her sister thought how glad she was that she had proposed going to Bolton. “It will take her mind up,” she thought, but she would not have said it to Martha for the world. Emmeline repeated this prayer over and over in a sort of rhythmic cadence. She fairly kept step with it, and yet she had not the slightest faith in the prayer. She could not really see why she should have. She had always prayed in such wise while carrying eggs to the Ticknors, and Spotty had never failed to race barking out to meet her, and sniff at her nervous, twitching little ankles and try little nips and tugs at her skirts. The prayer had never, so far as she could see, been answered, and why should she expect it to be now? Emmeline was a very honest little girl. She was reverent, and she believed God could keep Spotty from barking at her; but she did not believe that He would. Moreover, she was Christian enough to hope and trust, somehow, that these agonies of terror which she was called upon to undergo were in the end for her spiritual good. She did not complain, but she knew that she suffered, and she knew that Spotty would not fail to bark. Presently she turned that dreaded curve of the road, and she could see the wretched place where the Ticknors lived. The dwelling itself was an unpainted, out-of-drawing shanty, leaning so far to one side that it seemed it must topple over, but saving itself by a lurch in another direction. It was a very drunkard of a house, a habitation which had taken upon itself the character of its inmates. It was degenerate, miserable, and oblivious to its misery. Beside this main shanty was a stable, far out of the perpendicular, out of which looked a high-hipped cow. Sometimes Emmeline was afraid of the cow, which was often at large, but never as of the dog. There was also a pigsty and various other horrible little adjuncts of the main whole. Emmeline shuddered as she came in sight of it. The mere aspect of the place would have gotten on her sensitive nerves even if Spotty had not been there. But immediately, breaking upon her prayer, came the well-known vicious little yelp. Spotty was a mongrel, but he had wondrous ears. Emmeline espied the little animal coming for her so fast that he seemed a mere line of speed, but never ceasing that wild yelp. Emmeline prayed on, and walked on. It was strange that she never at such times thought of turning round and running. It never occurred to her to disobey her mother and not take the eggs to the Ticknors. She walked along, praying, her heart beating heavily, her limbs shaking. The little dog reached her. He was a little dog, and it was a sheer absurdity for her to feel such fear of him. He danced around in circles, a regular dog war dance, as she advanced. His yelps became louder and louder. It seemed inconceivable that such a small animal could have such a terrific bark. 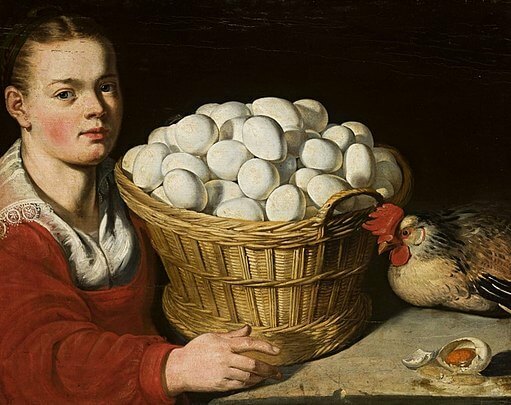 Emmeline went steadily on, toeing in, holding her basket of eggs in a hand which did not feel as if it belonged to her. It did not seem that her whole body belonged to her in any other sense than as a machine which bore her conscience, her obedience, her fear, and the basket of eggs. When she reached the Ticknor house she was blue-white, trembling with a curious rigid tremor. She knocked, and the little dog gave a furious, a frantic yelp, and tugged at her skirt. Then the second of her deliverance came. The door opened. An enormous slatternly woman, a mountain of inert flesh appeared. She bade the dog be quiet. He did not obey, but Emmeline had a sense of protection. It had occurred to her more than once that perhaps Mrs. Ticknor, in consideration of the eggs, would, if Spotty actually attacked her, sit upon him; that she would not actually let her be bitten. Behind Mrs. Ticknor the close room swarmed with children — children with gaping, grinning faces, some of them with impudent faces, but most of them placidly inert like their mother. The Ticknors represented the very doldrums of humanity. None of them worked nor progressed, except the father, who occasionally could be induced to do a little work for the neighbors when the supplies ran too low and actual starvation became a temporary goad. Today he was ploughing for a farmer, plodding lazily along behind a heavy old horse. He could scarcely be said to be working. Emmeline was glad that he was not at home. Sometimes he had been drinking considerable hard cider, and although he never spoke to her, the hard red in his face disturbed her; also the glassy stare of his stupid eyes. “Mother sent these eggs,” said Emmeline in a small, weak voice. Mrs. Ticknor took them with an inarticulate note of thanks, like a dumb beast. The children stared and grinned and gaped. All the dingy room seemed full of staring eyes and gaping, grinning mouths. The little dog yelped viciously, louder and louder. It was incredible of what a crescendo that small dog was capable. Emmeline pinned her faith on Mrs. Ticknor's coming to her rescue in case of an actual assault, but every minute she expected to feel the needlelike teeth in her ankle. All her flesh shrank and quivered. It seemed as if Mrs. Ticknor would never find a dish in which to deposit the eggs. Finally she did, however, and Emmeline took her basket. The little dog followed, with his circling war dance and his crescendo of yelps, to the curve of the road. Then, as was invariably the case, he turned suddenly and ran home, as if with a sudden conviction that the game was not worth the candle. Then Emmeline toed out, and walked on briskly, her head up; her trial for that day was over. The next morning the torture was repeated. It was like a historical promenade between two rows of Indians armed with cruel weapons. However, she survived it, and when she came home both her mother and aunt remarked upon her improved appearance. That was what so misled them. Every morning Emmeline returned from her charitable trip with such a sense of momentary relief that her face was naturally brighter than when she started, but all the while she steadily lost ground under the strain. Finally the doctor was called in and a tonic prescribed, and when school began, after the spring vacation, it was decided that Emmeline should remain at home, but try to go on with her class with Aunt Martha's assistance. “I think nothing except that morning walk to the Ticknors', to carry eggs, keeps the poor child up, anyway,” said Emmeline's mother, who had followed the doctor to the door. Emmeline overheard what was said; the door was slightly ajar. There was a curious little twitch about her sensitive mouth. Troubled as she was, she saw the humor in the situation. The very thing which was making her ill her mother regarded as her chief medicine. It seemed strange that Emmeline did not tell her mother of her true state of mind. The expeditions would have been at once stopped. She did not tell her, however, and probably for reasons which she did not herself understand. There is in every complete personality a side which is dark except toward its own self and God, and Emmeline realized this dark side in herself, although vaguely. She knew perfectly well that nobody, not even her mother, who loved her, could understand rightly this dark side, which was sacred to herself. She knew that if she told her mother how afraid she was of that little Ticknor dog she would be petted and comforted, and would never have to face the terror again; and yet she knew that her mother would secretly laugh over her and not comprehend how she felt, and it seemed to her that she could not face that. She would rather face the dog. So she continued carrying the eggs and praying, and the little dog continued barking at her and snapping at her heels and tugging at her dress, and she took the doctor's medicine, and yet she grew paler and thinner, and slept less, and ate less, and her mother and aunt thought that the daily walk in the open was all that kept the child up. Then, three weeks after she first began her charitable trips, something happened. It was almost the 1st of April, but the spring was very late, and that Wednesday morning had seemed to suffer an actual relapse into winter. The northwest wind blew cold, as if from northern snow and ice fields; the ground was frozen hard, and the farmers had been obliged to quit their plowing, which they had begun on mild days. The long furrows in a field which Emmeline had to pass before she reached the curve in the road lay stretched out stiff and rigid like dead men. In the midst of that field stood a little corn house, the door of which was open. Emmeline glanced casually across the field as she lagged along. She still wore her little red coat and hat, under which her soft fleece of blond hair flew before the wind like a flag. She glanced casually; then her heart gave a great leap and seemed to stand still. Over that rigid field she had seen a little live object scamper and make straight for that corn house, which he entered, doubtless in pursuit of some smaller, swifter thing which she could not see, possibly a field mouse or a mole. Emmeline knew the pursuer to be the Ticknor dog. A thought leaped into her brain — a thought so wild and audacious that she could not entirely harbor it for a second. Then all her faculties rose to action. Down on the ground she set her basket of eggs. Over the fence, with its tangle of leafless vines, she went, and across the field she raced, her little feet skipping from furrow to furrow, her hair streaming. She reached the corn house, and grasped the door, swinging outward and creaking in the cold wind, with a grasp of despair. She slammed it to, and fastened it. Emmeline at last had her enemy safe in prison. An angry bark and a scratching assailed her ears as she sped back to the road, but Spotty could not get loose. She was sure of that. It was a strong little house. Emmeline took up her basket of eggs and went on. Nobody had seen her. This was a lonely spot in the road. A mad exultation filled her heart. For the first time she was going to the Ticknors' without fear clutching her, body and soul. When she rounded the curve in the road and came in sight of the squalid little group of buildings they looked almost beautiful to her. She fairly laughed to herself. She almost danced as she went on. When she reached the house and Mrs. Ticknor opened the door as usual she saw for the first time what a really lovely little face the next little girl to the baby had, in spite of dirt. She smiled as she delivered the eggs, and stood beaming while Mrs. Ticknor emptied the basket and returned it. She had no need to look about or listen for any little spiteful animal now. She was quite safe. She went home light-footed. She was quite rosy when she reached there. “The dear child is really better,” her aunt said to her mother when Emmeline had gone to put away her outdoor wraps. Poor Martha herself looked, in spite of her pride and her high carriage of head, as if she needed some helpful tonic for either soul or body, or both. She had grown thinner, and although she smiled, the smile did not look spontaneous. In these days Martha smiled mechanically and only with her lips. Her lips curved prettily, but her eyes remained serious and thoughtful, even while she spoke about Emmeline's looking better. Emmeline did, in reality, seem better all that day. She even asked for luncheon between breakfast and noon. She slept well that night. She ate her breakfast with an appetite the next morning, and set out even merrily on her errand to the Ticknors'. It was still cold, and the northwest wind had not gone down. It had raged all night. When she came to the field in which the corn house stood the door was closed fast; no one was at work, and the plow ridges which later on would be green with waving flags of corn lay stiffly like dead men, as they had done the day before. Emmeline looked at the corn house. She thought, but she was not quite sure, that she heard a little plaintive sound, something between a whine and yelp. When she returned she was quite sure. She knew that she heard it. Her face sobered. When she reached home her mother and aunt exchanged glances, and her mother went into the kitchen to tell Annie to make some beef tea. Emmeline had to drink a cup of it when it was made. Her mother and aunt had agreed, with dismay, that she did not look so well as she had done the day before. She looked still worse as the day wore on and the days wore on. During three days Emmeline suffered tortures of remorse with regards to the little dog shut up in the corn house and perhaps starving to death, unless there might be some scattered corn left over from the year before, or rats. Emmeline was not quite sure as to whether Spotty would eat rats, even if reduced to starvation. She astonished her mother on the evening of the second day by inquiring, apropos of nothing at all, “Mother, do dogs ever eat rats?” And when both her mother and aunt seemed unable to answer positively in the affirmative, her little face took on an expression of white misery which amazed them. After Emmeline had gone to bed that night her mother told her aunt that if the child was not better before long she should call in another doctor. It was horrible for Emmeline during those mornings to pass that corn house, with its shut door and desolate field. She felt like a murderess. She was not quite sure whether she heard Spotty's plaintive whine. She wondered if he were dead and she had killed him. So Emmeline went. She had mysteriously tucked up the sleeve of her red coat a little parcel which contained two chicken bones. They were nice little chicken bones, wrapped in white paper. She carried also her little purse, in which she had some money of her own besides the pennies which her mother had given her to buy the yeast with. Emmeline flashed out of sight of the house windows, a swift little figure in red. “If she were grown up, I should think she had something on her mind,” Martha said, reflectively. “Of course she cannot,” said Martha, but her eyes were reflective. Meantime, Emmeline sped on her way. The store was on a street at right angles to the one leading to the Ticknors', which opened just before the field with the corn house was reached. Emmeline hurried to the store, bought the yeast-cake, and also with her own money a little paper bag of sweet crackers. Then swiftly, without a moment's hesitation, she ran back to the other road and across the field to the corn house. She listened for just one second before opening the door. She heard a little whine — not a bark, but a whine. Then she opened the door, and no soldier charging the enemy ever required more spirit than she; but open it she did. She held out the chicken bones. Then she flung them at poor Spotty, emerging trailingly from the dusty interior. Spotty caught at the little bones and crunched them down. Then Emmeline fed him with the sweet crackers. She put one on the ground. Then, as the little animal caught it up, a feeling of great love and pity overcame her. All at once she loved that which she had feared. She fed Spotty the rest of the sweet crackers from her little red-mittened hand, and did not have the slightest quiver of terror, even when the sharp little teeth were so near her fingers. After the crackers were all gone, Emmeline started homeward, and Spotty followed her. He bounded around her, leaping up, barking with joy. He was a poor little mongrel, and from heredity and poor training he had lacked the better traits of his kind. He had been mischievous, cowardly, and malicious. He had loved nobody. But now he loved Emmeline for setting him free and giving him food. He knew nothing of the injury which she had done him. He was conscious only of the benefit. So he followed her, as he had never followed any of the Ticknors. They, in truth, had never cared for him. They had simply been too indolent and too indifferent to turn him adrift when, a poor canine wanderer, he had located himself with them uninvited. But this was different. He loved this little girl, who had opened his prison door and fed him with nice chicken bones and sweet crackers. He had suffered, and she had come to his aid. He was still thirsty, but thirst also would be satisfied by her. He followed her with joyful faith across the field. When they reached the road leading to the store a man emerged thence, walking hurriedly. Emmeline knew him at once. He was Mr. John Adams. John spoke to Emmeline in a confused sort of way. “Oh, it is you, Emmeline!” he said. Emmeline glanced up at him, and saw to her amazement that his face was burning red, and he was smiling foolishly. “Do you think she will?” asked Mr. John Adams, eagerly. “I wonder how you would like it if I should come and live in your house, with you and your mother and aunt?” said John Adams. Emmeline slipped her little hand into his. “I think it would be real nice,” she said. “You dear little soul!” said Mr. John Adams. He squeezed her hand in his big strong one. “Is that your dog, little one?” he asked. “That is the Ticknor dog; he followed me.” Just then the dog leaped up, and Emmeline patted his head, laughing. “I am going to if mother will let me,” said Emmeline, with sudden resolve. The little triumphal procession went on its way. The west was a clear cold red. They passed a field in which stood scattered stacks of last year's corn. In the shadow the withered blades had a curious vivid crudeness of something which was rather tone than color. They gleamed out like newly cut wood, like naked flesh. They were elemental, belonging to the first: dry death, for which there are no paints on the palette, any more than for light and air and sentient life. But where the red western glow struck these blades of corn they were lit with brilliant reflections, and seemed to leap into flames of red gold. In the sky was faintly visible a filmy arc of new moon. A great star was slowly gathering light near it. Emmeline danced along, holding to Mr. John Adams' hand. Her head was up. Her whole face laughed. The little dog raced ahead; he ran back; he leaped and barked short joyous barks. They were all conquerors, by that might of spiritual panoply of love with which they had been born equipped. There was the dog, in whom love had conquered brute spite and maliciousness; the man in whom love had conquered self-will. But the child was the greatest conqueror of the three, for in her love had conquered fear, which is in all creation its greatest foe, being love's own antithesis. Enjoy more stories in our collection of Dog Stories. Add Little-Girl-Afraid-of-a-Dog to your own personal library.